And check out OUR NEWLY LISTED ITEMS. 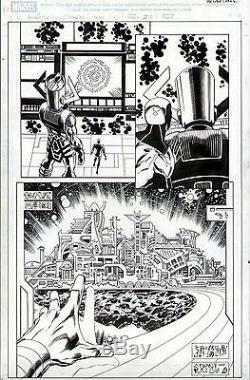 This is an original art page to Last Planet Standing #1, which was published by Marvel Comics. This is Page 22 from the issue, and this spectacular page features Galactus and an awesome half-splash showing Asgard, home of the mighty Thor and the Norse Gods. The artwork is by Pat Oliffe (well-known for great work on both Spiderman and Spidergirl). This is an amazing piece that would look fantastic framed and prominently displayed, and would be an outstanding addition to any collection. Check out our other auctions for more great items. Check it out, you'll be glad you did! The item "GALACTUS & ASGARD HALF-SPLASH MARVEL LPS #1 PAT OLLIFFE ORIGINAL COMIC ART PAGE" is in sale since Thursday, September 8, 2016.